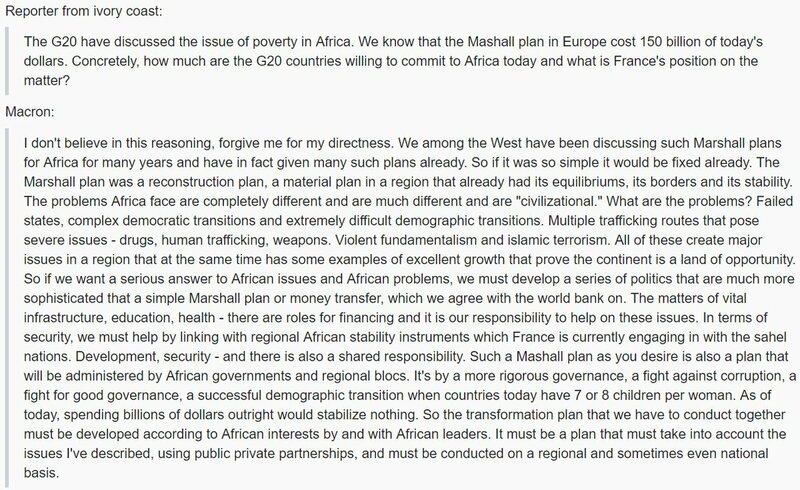 At a press conference at the G20 summit in Hamburg on July 8, French President Emmanuel Macron answered a question from a Cote d’Ivoire journalist. The French colonial empire ruled over much of North, West and Central Africa from around 1830 until 1960. During this time, African peoples were labeled “French subjects” but as a rule could not own property or vote. By the time the last French colonial country — Gabon — fully gained its “independence” in 1960, France had left behind a legacy of colonization, slavery and pillage. It has been discussed ad nauseam why the rhetoric that there’s one story for all of Africa is damaging to the progress of African countries and the dignity of African people.